Description Project seismic stacks onto arbitrary angles to enhance or suppress different AVA responses (similar to Extended Elastic Impedance [EEI]). The Amplitude Variation with Angle (AVA) Stack Rotation process is DUG’s implementation of Extended Elastic Impedance (EEI). EEI can be defined as a constant angle projection of seismic data designed to help discriminate between different AVA responses. It is a combination of intercept and gradient — one can think of it as a weighted stack of intercept and gradient, which is also equivalent to a weighted stack of near and far angle traces (Whitcombe, D.N., Connolly, P.A., Reagan, R.L., and Redshaw, T.C., 2002, Extended elastic impedance for fluid and lithology prediction: Geophysics, Soc. of Expl. Geophys., 67, p63-67). Different stack rotations or weighting functions can optimally enhance or suppress certain types of AVA. 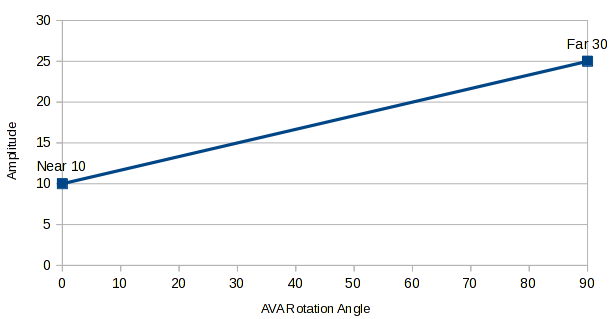 For instance, you can define a stack rotation angle in the near-far space. 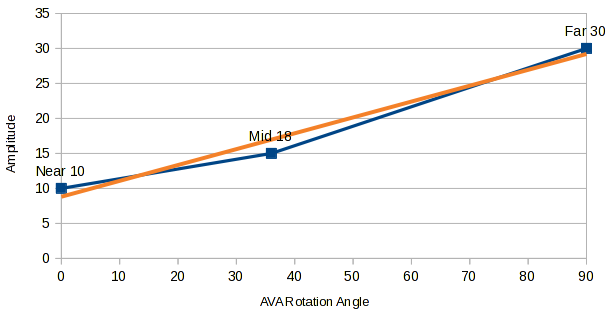 Every stack rotation angle (from -90° to 90°) defines a specific weighted combination of the near and far angle traces. The input near and far AVA attribute data could be seismic amplitude data (e.g. angle stacks) or it could be inverted amplitude data like relative near and far elastic impedance. When supplied with multiple stacks, Insight performs a linear regression for the stack amplitudes at their specified angles. The rotated amplitude is calculated from this line. The rotated angle (θ) is projected such that θ=0 is the smallest stack angle, and θ=90 is the largest stack angle. For best results, use three or four amplitude and frequency balanced stacks with minimal residual moveout. Additional stacks will incrementally improve the result. The AVA Stack Rotation process is used to explore changes in AVA response for an event. This process is used in combination with the Rock Physics Module to identify lithology/fluid interfaces. The Rock Physics Module provides tools to predict the AVA for different lithology/fluid interfaces. In the Details Panel, click the Add Row icon to add and select input stacks for the process under the Stack column. 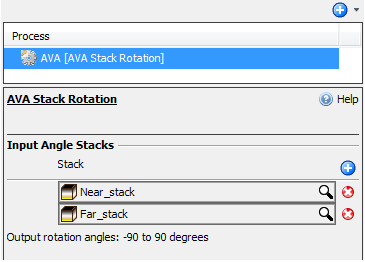 You need to select at least two input stacks from the same survey for the AVA Stack Rotation process. where θ is the stack rotation angle. If near and far stacks are supplied, the displayed traces for θ=0 are the same as the near stack. This is illustrated in the plot below. If you are using more than two input angle stacks, you should provide an "effective" angle of incidence for each stack, that is, the mid-point of the angle range. For example, use 10° for a stack with an angle range of between 5°–15°, 20° for a stack with an angle range of 15°–25°, and 30° for a stack with an angle range of 25°–35°. 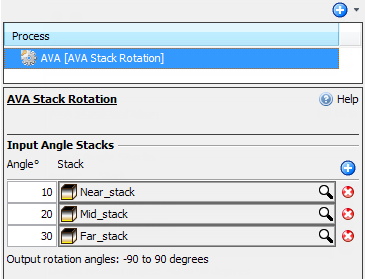 Under the Angle° column, type the rotation angle for the corresponding input stack (the Angle column will only be available if there are more than two input stacks). The displayed traces for θ=0 may not be exactly the same as the near stack, as it will depend on the input amplitudes. This is illustrated in the plot below. As a result of this process, a new volume will be added in the Volume tab. To quickly open the output volume, right-click the process item in the Process tab and click Open Child Volume. Vice versa, you can also open the process from the Volume tab directly. To do this, right-click the volume which was created from a process (indicated in italics) and click Open Parent Process. 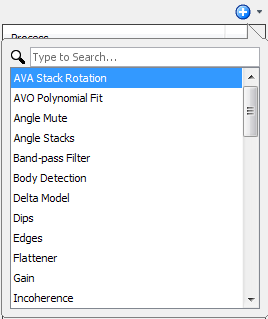 See image below to view the AVA stack rotation volume in Gather View. 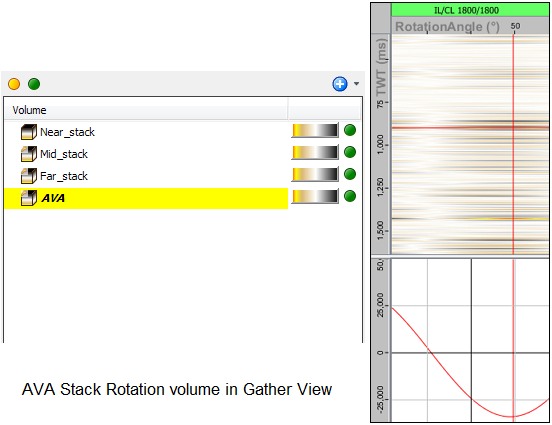 Tip: Move the navigation marker to different rotation angles to see the amplitude variations.